As some of you have been following my "travelogue", I arrived at Atlanta airport 2 hours ahead of schedule. So far ahead in time that I had to wait a couple of hours for my host to show up. So there I was sitting and firing up my laptop to watch a couple of movies. One thing about watching movies on the laptop is that the battery will drain. As I have been catching up on my shows at Greensboro airport and on the flight, I was left with about a hour of juice. It wasn't before long before I had to get off my arm chair and step to the opposite wall where there was a power outlet for me to keep the laptop going. As soon as I plugged in my laptop at the opposite wall, an ang moh gentleman approached me if he could have my seat. The immediate timing probably suggested that he has been eyeing my arm chair for quite some time liao. I said yes thinking that I am stuck to the opposite wall anyway. It kinda reminded me of my NTU days where I removed the canteen table from the lunch crowd (Goto Question. 4). Ahh... karma has finally come full circle. Anyway, here the picture of the empty corner after "my arm chair" kena kapoked. 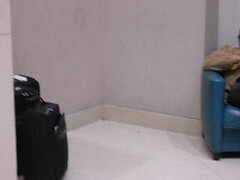 That's my luggage on the left. 1) you cannot call your host to come and pick you earlier meh! 2) no pic of empty corner (without chair) leh! 3) Dr pepper - all the flying caused yr taste buds to go bonkers liao? 4) petrol in s1ngapore dropped 3 cts this wk. mihuatang: 1) My host was driving from North Carolina while I was flying. So I had to wait for him while he was still on the road. 2) Try refreshing your browser lah. I can see it perfectly from here leh. 3) I have very acute sense of smell and taste. A lot of people can vouch for me on that. i wanna try dr pepper! nadnut: Actually Dr Pepper is available in Singapore. I used buy them by the carton from Jason's Supermarket behind Orchard Towers. I think they still have it. 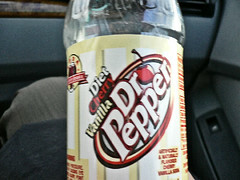 Bleugh... i can't stand Dr Peppers!! you can also get Dr Pepper at the cafe at the Raffles Hotel (what was called seah st deli - i don't know if it's still there). when was the last time i was home??! Pam: Yup, it's called Seah Streeet Deli and it's still there the last time I was back. The place where everything is good except the sandwiches coz the bread is rock hard. mihuatang: Ironically isn't it. You can now see a picture with nothing in it. Same as not seeing the picture hor? Lynne: Dr Pepper is my all time soda pop even if it mean paying SGD 1.00 per can back when I was still in Singapore. yes, the irony of it all. but can see your luggage and a partially hidden blue chair. mihuatang: You mean you guys can recognise my luggage? 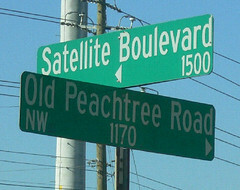 Lynne: Peachtree.... hmm... Are you stalking me??!!?? Lynne: Just yanking your chain there. I didn't have the chance to go to Peacetree itself as these few days have been spent meeting with attorneys, clients and a bit of market research. Maybe next time. Just maybe. you said it yrself in the post: "That's my luggage on the left." wah lau...I read Drabble when it was featured in Sunday Life like....15 yrs ago? The Dr. Pepper thing seems good. Send one back! Dilbert, Big Nate, Pearls Before Swine, Pickles, Drabble, B.C., The Humble Stumble, Baby Blues, Marvin, Mother Goose & Grimm, On The Fastrack, Sherman's Lagoon, Zits, Triple Take, Bound & Gagged, Adam@Home, Doonesbury, Foxtrot, Garfield, Helen - Sweetheart Of The Internet, Non Sequitur, Shoe, Big Top, Pooch Cafe, In The Bleachers, Loose Parts, Compu-Toon, etc..